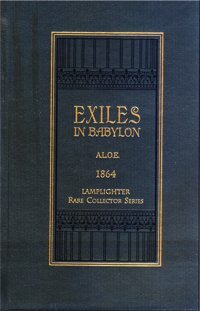 Exiles In Babylon, the second in this dramatic series by A.L.O.E. (A Lady of England), makes the Scriptures come alive! The pictures are so vivid, the characters so real, it is as though we are walking alongside Daniel and his faithful friends, experiencing the momentous challenges they are faced with. What courage! What great faith! Yet we are ever mindful that they were merely flesh and blood, no different than we are, and that our daily challenges can be met with the same fortitude and grit.